There are shoes you buy, you wear and you dispose of. Then there are those by Salvatore Ferragamo, the ones that, at the end of the day, you keep so that, if she's lucky enough, your daughter might one day inherit that vintage piece. On its eightieth year, Ferragamo mounts its retrospective, "Salvatore Ferragamo Evolving Legend 1928-2008," in Shanghai's Museum of Contemporary Art (MoCA). Curated by Ferragamo Museum's own Stefania Ricci, this retrospective offers a comprehensive look into a brand that's helped shape the shoe industry over the past century. Pinpointing Shanghai as a city rich in history with a promising future, the Ferragamo family deemed it a fitting locale to celebrate their own history and exhibit what lies ahead for the brand. "Ferragamo's largest market is Asia," says MoCA Marketing Director Diana Freundl, "and Shanghai is the center of fashion in China. This exhibition helps bridge art and design." Spanning MoCA's two floors, 541 iconic Ferragamo pieces showcased in eleven captivating sections walk you through a lesson in fashion history. It starts off with the "Hollywood Boot Shop," displaying custom-fit shoes Ferragamo made for budding Hollywood stars in the 20s, the likes of Mary Pickford and Greta Garbo, alongside costume shoes for blockbuster hits like Cecil B. de Mille's The Ten Commandments. Moving along, a massive image of Palazzo Spini Feroni is reflected on an arched screen, re-creating where the company's story begins and where a sensory experience unfolds. The workroom-Clittered with leather strips, wooden lasts and unfinished shoes-Cis surrounded with frames of craftsmen at work. The smell of leather fills the air as you walk into the materials hall full of luxurious calfskin, exotic crocodile, multi-colored raffia and beaded weaves flanking more celebrities' shoes. Then come the classic Ferragamo patents-Cthe unmistakable Gancino clasp on Ferrragamo bags, timeless Vara shoes, shell-shaped soles that are not only Audrey Hepburn chic but also very comfortable and best of all, the wedge, an invention women all over the world love. 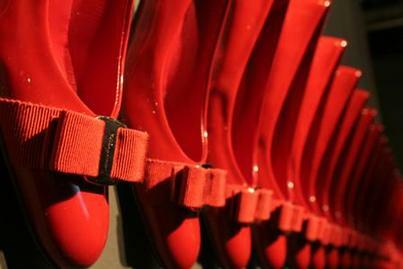 The exhibit is capped off by a showcase of Ferragamo bags, dresses and shoes that have appeared on the red carpet, in movies we love and on people we admire. "There is no limit to beauty," Salvatore Ferragamo famously said. "No saturation point in design, no end to the materials a shoemaker may use to decorate his creations so that every woman may be shod like a princess." Indeed, the Ferragamo family is making sure it stays that way.